For those of you who know me personally, it shouldn’t come as a surprise to hear one of my first posts is about food. 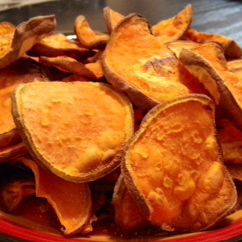 Earlier this week I decided to make my own sweet potato chips. Hands down one of the easiest things I’ve ever made. *Disclaimer: I am not a cook! However, I’ve decided I’m going to branch out and try cooking real food rather than my go-to college diet consisting of Ramen and grilled cheese. So, I’ll start slow and work my way up to the good stuff. Okay, back to the chips. 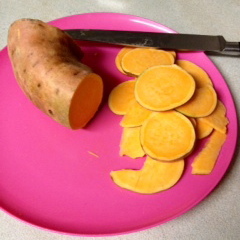 All I used for this was a medium sized sweet potato and some salt to flavor. First I set the oven to pre-heat to 475°. Then, I sliced the potato into pieces as thin as I could (reflecting back, I would have gotten two small potatoes rather than just one medium sized, to make it easier to cut). 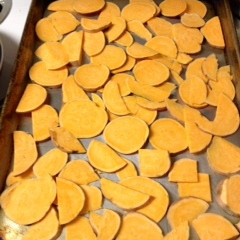 Once they were all cut up and placed on the tray, I popped them in the oven for 20-30 minutes. My apartment oven is close to ancient so I made sure to check in every few minutes when the time got close to 20 minutes. Seeing as I’m no great cook, my potato slices were not very consistent so I ended up taking some out earlier than others to prevent burnt crisps. To season, all I did was toss a little salt on but there are other options, as well. I think these would taste great with an avocado dip or tossed around in a honey and pumpkin spice mix to satisfy that sweet tooth and the pumpkin everything craving that tends to take over this time of the year. All in all, I can’t complain with the results. How will you season your chips? Enjoy!